Hey guys! Thanks to everyone who came out last night. We had a really good time playing for y’all. We made the best of a boring holiday AND the weather. Not bad. If you saw any of the merch last night and was like: oh man, I want that but I can’t buy it now…. Fear not! You can still purchase ANY of the items you saw yesterday on our Bandcamp – Merch page. Also, we’re working on the audio and video from last night… Stay tuned! Lastly, if you’re in the NYC area on St. Patrick’s Day (March 17th), we’ll be playing a small set of music at Spectrum. Check out the details here. Again, thanks for coming out and supporting this nerdy little chamber ensemble from Philly! Hi again folks! Our show is this Saturday and we’re still having some of the Beta Testers provide sneak peaks into their arrangements. Today, Steve will provide a small peak into his medley of music from Earthbound. Enjoy! Great! Hi again folks! 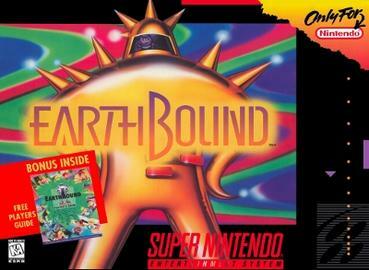 Today, I’ll discuss my arrangement of tunes from Nintendo and HAL Lab’s Earthbound (Mother 2). I’ve always wanted to do a medley of the music from Earthbound. The game has a massive cult following. There are people who are very loyal to the series, especially since the 1st and 3rd installments of the series were never officially released in the US. I’ll be honest, I never really gave Earthbound a good play-through. I think I got to Winters and stopped or something. It was long ago. Strangely, my idea to do this medley was actually inspired by the music from Mother 3. I recently finished playing through the fan-translation version of the game and was enamored with the gameplay and story. It got me listening to Earthbound‘s music again and I figured it was finally time to do a proper medley of the music. I was first astonished by the size of this soundtrack! This soundtrack is a massive 122 tracks of music. It took me a long time to wade through. Still, there’s a lot of good choices for our set up. Much of music is in a “jazz big band” style and setting. We have a soprano sax, french horn, a trombone, a tuba, keyboard, and drum set. My early favorites for covering were, in no particular order, “Pokey Means Business”, “Demo Intro”, any of the town themes (I had already arranged “Winters” for Beta Test’s last show), “Saturn Valley”, and maybe really any of the battle themes. I figured that doing a whole “Runaway Five” set would be cool too, especially because of our instrumentation… but I also felt like that could literally be its own medley. Yeah. Uh, I didn’t think a trombone could make some of these sounds so I had to pass. Though, I love these tunes. Anyhow, let’s see how this turns out. One of the things I realized right away is that tuba did not fit in the medley. I could use it to cover “Saturn Valley” but it just wouldn’t provide the right sound for many of the heavy bass driven tracks. So while I had originally planned on having tuba, I decided to write the piece for soprano sax, french horn, trombone, bass guitar, toy piano, and drums instead. And yes, I added toy piano. You’ll see how that fits in in a moment. The completed piece is a medley but structured in three movements. This gives us the option to pause between pieces for instrument changes or what have you. On February 2nd, however, we will be performing it without stops. I felt like this is the perfect opener to the medley. The piece could actually stand alone as an opener, really. The best part of this piece is the instrumentation. It’s like it was perfectly designed for our ensemble. I put the “trumpet” line in soprano sax. French horn would serve as a “trombone 1” and trombone could cover the lower trombone sounds in the piece. Bass would play… well… bass. There’s bound to be some parts missing in the drums because of the dense texture but I tried my best to figure that out. Also, there is a CRAZY, almost “just for effect” triplet run at around :44. Yeah, I kind of wrote something else there. There’s no way we could make that sound like music haha. So yeah, I did choose to include some town themes. I figured that these are tracks that even the casual gamer would remember. I assigned soprano sax to all the upper lines you hear. I made the trombone cover the upbeats. The french horn helps out with the counter melody. The melody at :45 sounds like it was written for a MIDI trombone… so why not a real trombone? Bass is bass. I decided to try to retrofit some of the weirder instruments here into our ensemble. The result, unfortunately, is the loss of guitar strumming, weird glockenspiel like sounds, and some other effects. I feel like it’s still very effective, though. Any of you familiar with the game will be pretty much amazed that I decided to include this piece. And I wanted to make sure we do it justice because it’s so freaking awesome. I have soprano sax, stopped french horn, and muted trombone cover the 3 “emulated” NES lines. The drum part is written to be played as mechanical as possible. I doubled up the very little melody before the 2nd part of the piece (I like to call it “Business Time”). Now, “Business Time” presented issues. I originally wrote the part to include double bass drum pedals and the whole deal. Unfortunately, I found out that our drummer did not have any experience with metal drumming and I didn’t want to put him in an awkward situation. Therefore, I changed the drum part to be more of a “punk rock” feel instead. Everything else though? Line for line covered. I have our guitarist come in JUST for this piece and rock out with total distortion. I’m pretty proud of how this particular part turned out- it’s going to be so cool live. To finish it off, I decided to include “Eight Melodies” and have the main line on toy piano. I re-orchestrated the bass line and harmonies for some extra surprises. The entire melody ends with a short bass guitar and toy piano duet. Want to hear how it turned out? This arrangement will be premiered by the ensemble at our show this upcoming Saturday, February 2nd, at First Unitarian Church – Chapel in Philadelphia. It’s going to be great. You better be there!